Over the past two weeks, we've asked listeners to tell us who their favorite Alabama football player is and why. We ended up with more than a hundred calls, tweets, and Facebook comments and that helped us narrow it down to 32 of the greatest players to ever wear a Crimson Tide uniform. Now we shift to the voting stage to determine which player from the greatest college football program of all-time is the favorite among fans. 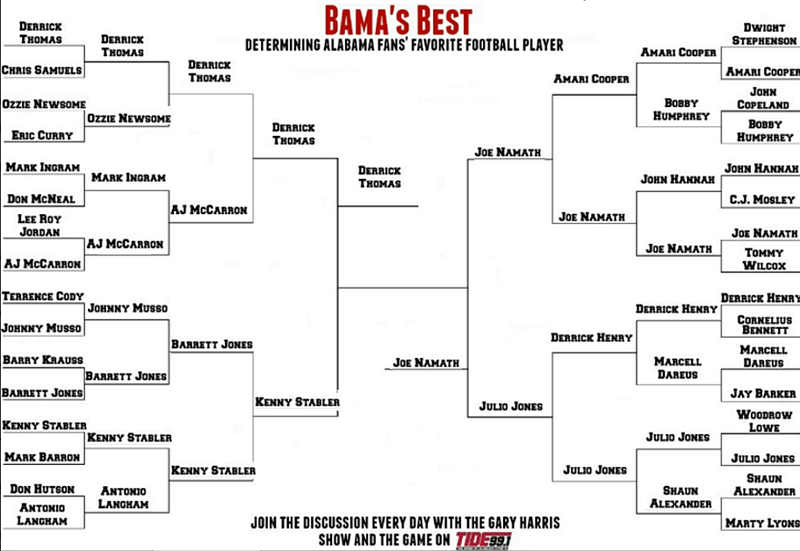 For the next week, we'll continue the debate on-air, but you'll also cast your vote on the Bama's Best bracket as we advance a round each day. Voting begins each night this week at 7PM and concludes at 5PM the following day. The round of 32 begins Monday night and lead up to the finals that begin on Friday night. A culmination of two weeks of voting has come down to the final two players: Derrick Thomas and Joe Namath. Arguably the two greatest players in the history of Alabama football are facing off for all the marbles. Who is Alabama fans' favorite player? Vote now!